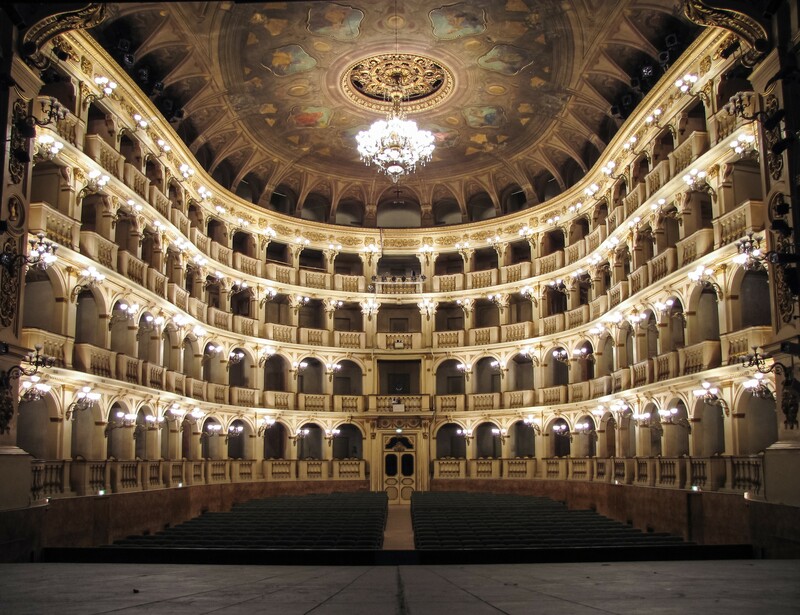 The Teatro Comunale is one of the most important opera venues in Italy, and is home to most high profile performance in Bologna, from opera to orchestral works, to ballet and contemporary dance. The Teatro Comunale makes up one flank of the famously chaotic Piazza Verdi, drinking spot of choice for students and bon vivants. Therefore, entering the theatre is an amusing contrast, orderly and quietly extravagant. The entrance hall and bar are small and do not circulate very well, however on entering the theatre proper you realise that it was probably a conscious sacrifice. The theatre is lavish and beautifully proportioned, rising up out of the nothing of the entrance. The acoustic is intimate and sensitive thus catering to an informed audience, while still providing the scale for the full-blown slap in the face impact that an opera company plus orchestra should be able to hand out when necessary. The Teatro Comunale opened on 14 May 1763 after its predecessor, Teatro Malvezzi, burned down in 1745, and owes its name to the fact that it was the first major opera house to be built with public funds and owned by the municipality.